The worldâ€™s first 12G-SDI broadcast camera for live Ultra HD production with 10â€ viewfinder, 12G- SDI, MFT lens mount, support for up to 2160p60, talkback, tally and more. Introducing Blackmagic Studio Camera, the world’s most advanced broadcast camera for live production. Inside its incredibly tough, lightweight magnesium alloy body you get a massive 10” viewfinder, talkback, tally indicators, phantom powered microphone connections and built in SDI connections that let you connect to your switcher with a single cable. Now available without Fibre Module meaning it costs you less. This updated model now ships without a battery as many users were found to be using the camera in a studio environment and powering off AC. The end result is the camera is able to be sold at a reduced price. 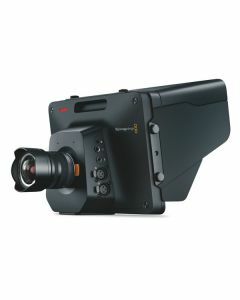 The fantastically bright and large viewfinder, as well as the compact size of the Blackmagic Design Studio Camera, make it well suited for use in the production of talk shows, sitcoms and broadcast news in the studio, or even live concerts and sporting events. This camera is ideal for multiple camera live production in any locality. The combination of a compact design, foldable sunshade and interchangeable lenses mean that an entire multi camera live production rig can be packed into a single road case. What’s more, because it’s so easy to setup and use, the Blackmagic Design Studio Camera is also at home in corporate AV departments, houses of worship and schools. The Studio Camera’s magnesium alloy body is small, robust and jam-packed with innovative technology. It is the most rugged, portable and advanced studio camera in the world. It features a huge 10” viewfinder with sunshade for optimal viewing and control, a flexible MFT mount delivering more lens options than any other studio camera, multiple mounting points and professional broadcast connections. Designed with the latest miniaturisation technology and features, the Blackmagic Design Studio Camera is the world’s most advanced camera specifically designed for multiple camera live production. Ultra HD is the broadcast standard of the future. 4K content is already being delivered to consumers today through web video channels like YouTube and Vimeo, from the newsroom to live sporting and theatrical events. New Ultra HD displays deliver a picture that has 4 times the resolution of 1080 HD. In other words, a colossal 3840 x 2160 pixels. There is currently no faster way to capture the beauty and realism of Ultra HD 4K than to record a live switched program with a Blackmagic Design Studio Camera. The Blackmagic Design Studio Camera features an active Micro Four Thirds lens mount compatible with an extraordinarily wide range of lenses and adapters. Use your existing photo lenses for smaller setups or fixed camera use, or bolt on incredible broadcast ENG lenses for large live broadcasts. Third party lens adapters allow you to connect to all kinds of lens mounts for virtually any type of lens, and you can even add feature film PL mount lenses – it’s truly possible to customise your camera to suit any size production. Before installing the software, we recommend that you run "Uninstall Camera Utility" first. This software update adds in camera HFS+ (Mac) and ExFAT (Mac/Windows) disk formatting to Blackmagic Cinema Camera and the Blackmagic Pocket Cinema Camera.